"The lecturers were really good. They kept me really interested, especially after teaching full-time all day, and then going in during the evening: I imagine it’s quite hard work to motivate people." 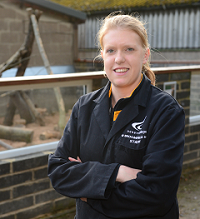 Former animal welfare degree student Elizabeth Spinks says Derby College has given her the opportunity to expand her career into teaching. Elizabeth, 26, used her qualification from the University of the West of England in a number of roles – educating animal lovers about cat care – but she felt she needed a more challenging job. She answered a Derby College advertisement and landed a part-time teaching position which led to a full time post at Broomfield Hall. Elizabeth, from Mapperley, Nottinghamshire, teaches practical and theory in the care of small animals including rabbits, guinea pigs and alpacas. Describing her job as half assessor-trainer/half lecturer, Elizabeth mainly teaches school leavers. As part of her role she studied part-time after work in Education and Training at Levels 3 and 4 at the Roundhouse in Derby. She praised the motivational and mentoring skills of the lecturers and said the classes were always “relatable” to the workplace. Now Elizabeth is taking her PGCE teaching qualification, while covering for a lecturer on maternity leave. Her aim is to “keep improving” and possibly to progress to become a full-time lecturer. Elizabeth said: “The lecturers were really good. They kept me really interested, especially after teaching full-time all day, and then going in during the evening: I imagine it’s quite hard work to motivate people. “I found it very good, and really interesting and it definitely increased my confidence a lot for teaching.